Order Simply Gluten Free Ale 40 pints from the Stirling Homebrew Shop UK. Buy Simply Gluten Free Pale Ale Beer Kit - 40 pints and other Beer Kits & Cider Kits safely online in the UK. This beer kit makes a gluten free pale ale. Beer kit to make 40 pints of gluten free ale at home. Each Simply Beer Kit has been crafted with the help and expertise of our dedicated team of master brewers. Each kit uses a blend of high quality malt extracts from numerous producers from around the world, with the addition of genuine brewer's yeast used in each and every Simply Beer Kit has helped us achieve our goal in creating a range of kits that is truly outstanding when it comes to quality, taste and value. Our UK Homebrew Shop sells real Simply and other Beer Kits & Cider Kits safely online to customers throughout the United Kingdom in England, Wales, Scotland and Northern-Ireland. View more products on the Stirling Homebrew Shop from Simply. Where to buy Simply Gluten Free Ale 40 pints safely online? Shop at the Stirling Homebrew Shop if you are wondering where you can buy Simply Gluten Free Pale Ale Beer Kit - 40 pints safely online in the United Kingdom. 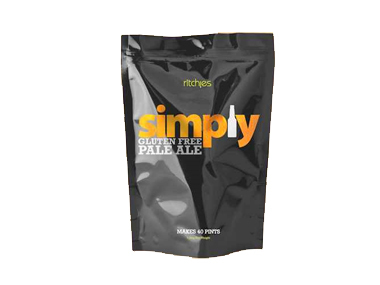 Simply Gluten Free Ale 40 pints - Simply Gluten Free Pale Ale Beer Kit - 40 pints in Beer Kits & Cider Kits and Homebrew.